TINY BABY IMOGEN WAS BROUGHT BACK FROM THE DEAD AFTER SPENDING FOUR MINUTES TRAPPED UNDER WATER IN A CRASHED CAR. MUM BECKIE, 21, MANAGED TO ESCAPE WHEN SHE LOST CONTROL OF HER PEUGEOT IN A LANE IN SPALDING, LINCOLNSHIRE, AND IT FLIPPED INTO A FLOODED DITCH – BUT THERE WAS NO SIGN OF HER DAUGHTER. BECKIE BEGAN TO FRANTICALLY SEARCH FOR HER BABY – BEFORE SHE SPOTTED THE TOT’S TOES POKING OUT OF WATER. SHE PULLER ‘BLUE AND LIFELESS’ IMOGEN OUT AND A PASSER-BY GAVE CPR UNTIL IMOGEN EVENTUALLY STARTED CRYING. THEY WERE FINALLY AIRLIFTED TO HOSPITAL AND BECKIE HAS NO IDEA WHO THE GOOD SAMARITAN WAS. CAN YOU SHARE THIS STORY AND HELP US FIND HIM? A mysterious hero stranger gave baby Imogen CPR and then disappeared. Mum Beckie would love to say thankyou. My youngest daughter Imogen giggled with glee as she splashed about in her tiny baby bath. She loved spilling soap suds everywhere much to the amusement of her big sister Alexis, 6. Both girls loved their bath time and would always sleep well after a long soak in the tub. “Goodnight girls,” I said as I kissed them on in the head in turn. As I walked downstairs I took a moment to glance out of the window at my new Peugeot 206 on the driveway. It hadn’t yet been two months since I’d passed my driving test and I was already loving life on the road and so proud of my first car. Being a single Mum, juggling two children under five with my nurse training was always going to be a handful – but having a car made life so much easier and it got us into a nice routine. Tuesday September 17th started like any other. I got the girls up and gave them their breakfast as I packed up my paperwork for college. Then once we were all ready I settled them down in the car as I drove off to Alexis’s school. Once I’d waved goodbye to her at the gates and I began the journey to Imogen’s nursery as she gurgled away in the passenger seat beside me. I knew the road to the crèche like the back of my hand. Cars thundered down the lane at 60mph but I knew to be careful around those tight bends. Today was no different. I was following the road ahead with caution as we travelled around a blind corner. My heart stopped for a second as I saw a van hurtling towards us at brake-neck speed. The driver had obviously moved to the centre of the road to get a better view ahead but there was no time for me to get out of the way. Instinctively I did my best to avoid a collision so I gripped my hand tight around the steering wheel and pulled it to the left. But things got out of control quickly and the car veered off the road causing us to hit a bank. The car was flying through the air and completely flipped over. What happened next is all a bit of blur, but I remember being thrown around like a rag doll before I felt us land – not with a bump, but with a deafening splash. After that everything went quiet and all I could hear was my heart racing. I soon realised I had travelled to the back of the car. The force of the crash had ripped my seatbelt off. Out of the window I could see we’d landed in a water logged ditch and the contents were gushing into the car. ‘I’ve got get out right now,’ I thought as I battled to kick the front doors free. They were both jammed shut so I tried the back and after a struggle I managed to wedge one of them open. When I eventually stood up my body was submerged in water. I was aching all over but I noticed the searing pain in my elbow above everything else. The car keys had pierced and become stuck in my skin as we got thrown about. The adrenalin was pumping around my body so it looked much worse than it felt. There wasn’t time to worry about myself now I was free there was just one thing on my mind – Where is Imogen? My heart was fluttering as I frantically scanned the murky waters for any sign of her. By this point time was ticking on and strangers who had heard and seen the crash came over to help. “Are you alright?” A voice from the bank cried to me. “My daughter’s still missing,” I sobbed back to them in despair. It was then that I saw 10 tiny pink toes sticking up out of the dirty water. My body jolted forward and I waded through as fast as I could to get her. As soon as I got close enough I lunged, grabbing Imogen by the feet to pull her up. She didn’t cry – she was completely blue, and lifeless. I later discovered she’d been under there for four minutes. Not wanting to waste any more time I literally threw her to the nearest person on land. The man who picked her off wrapped her in his t shirt to try and warm her freezing body up. Then he laid her on the grass and began performing CPR as I scrambled up the bank to join them. Watching him pump her tiny chest melted my heart. “Please let her be OK,” I prayed clasping my hands together. The stranger looked up at me with a look in his eye that seemed to say, ‘This might not work, please don’t pin all your hopes on me.” But he was all I had. The man was pressing away at her chest for what felt like forever, but I was desperate for him not to give up, and thankfully he didn’t. He carried on tirelessly until Imogen let out a sob. It was the most beautiful sound I think I’ve ever heard. Even then he kept on going – just to make sure she really was still with us. I literally watched him bring her back to life before my eyes. Over the sounds of Imogen’s crying and my ‘thank you’s was the screech of an ambulance siren. I breathed a massive sigh of relief as I finally accepted that things were going to be alright. As soon as the paramedics arrived the mysterious stranger leapt into his van and drove off. We never saw him again. I didn’t have time to ask anymore as I joined Imogen in the back of the ambulance and we set off to the hospital. Luckily after having her stomach and lungs pumped to remove the excess water, she went on to make a full recovery. I call her my little miracle now. It’s shocking to think she was classed as dead for seven minutes. The only time I think she’s aware of how close she came to something terrible is when I try and put her in the bath – she cries now when her feet touch water which is a complete change from how she was before. 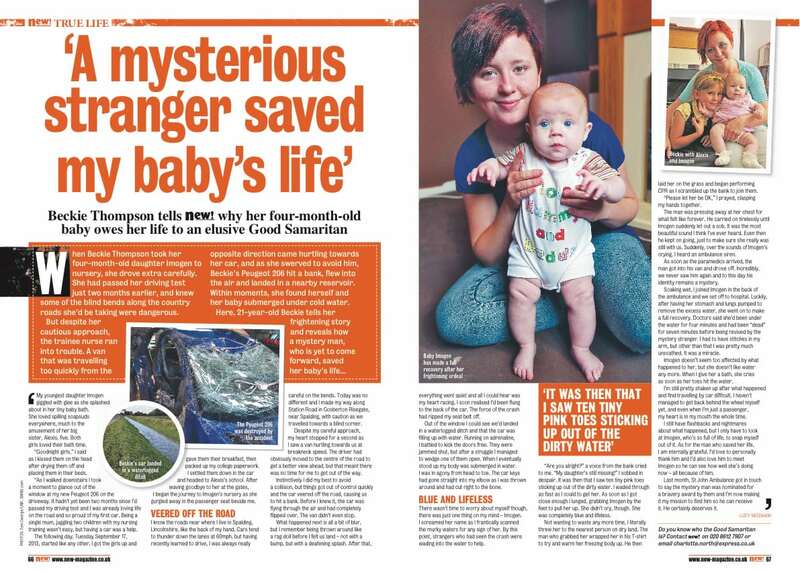 A hero stranger saved my baby. I am just so grateful to the man who saved her life. Without his help I don’t know what would have happened, things could so easily have ended very differently. I’d love to personally thank him myself. I’d also love for him to meet Imogen and see how well she’s doing now – and let him know that’s all because of him. Do you have an amazing true story to tell? Sell your story to a magazine or newspaper and get paid today. We want to share your incredible experiences, triumphs and tragedies. Simply fill out the form on the right hand side of the page today. You can read more about selling your story on this page: sell my story to a magazine or newspaper.